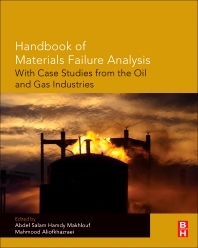 Handbook of Materials Failure Analysis: With Case Studies from the Oil and Gas Industry provides an updated understanding on why materials fail in specific situations, a vital element in developing and engineering new alternatives. This handbook covers analysis of materials failure in the oil and gas industry, where a single failed pipe can result in devastating consequences for people, wildlife, the environment, and the economy of a region. The book combines introductory sections on failure analysis with numerous real world case studies of pipelines and other types of materials failure in the oil and gas industry, including joint failure, leakage in crude oil storage tanks, failure of glass fibre reinforced epoxy pipes, and failure of stainless steel components in offshore platforms, amongst others. Materials engineers, chemists, and research scientists working in materials engineering and failure analysis, primarily in the oil & gas industry. Abdel Salam Hamdy Makhlouf was formerly a Professor at the Faculty of Engineering and Computer Science, University of Texas Pan-American, USA. Mahmood Aliofkhazraei is assistant professor in the department of materials science at the Tarbiat Modares University, where he also earned his master's degree and Ph.D. in corrosion and protection of materials. Dr. Aliofkhazraei has authored over 60 scientific publications on nanostructured coatings and thin films and has received numerous scientific awards, such as Khwarizmi award. He was selected among the 10 top best nanotechnologists in his country.